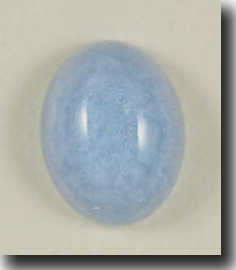 Ellensburg Blue Agate is one of the most rare blue agates in the world. It is becoming increasingly more rare as virtually all of the hunting ground is now located on private property. Found near the town of Ellensburg, Washington. In the NW corner of the lower Kittitas Valley. This gem was deposited by glacial movements. The exact origin is unknown at this time. However, Teanaway basalt is the host rock for the Ellensburg Blue Agates. This basalt has a characteristic reddish brown appearance and covers many square miles of Kittitas County. The Color of Ellensburg Blue ranges from a light, sky blue on up to a cornflower blue. We have also seen it in an almost royal purple blue. Much like that of Oregon's Holly Blue agate. Ellensburg Blue Agate is usually layered and clouds, streaks, or bands may form in the stone. This gem also graduates from nearly transparent to opaque. The stone in this picture has a turtle back pattern often found in agates. The turtle bsck pattern is formed by botryoidal (grape-like) structures that manifest internally.